There is something so satisfying about visiting the mall this time of year, in the midst of all the madness, and not participating in it, only observing it. Too bad I'll probably get sucked into the participation part of it in a matter of days. 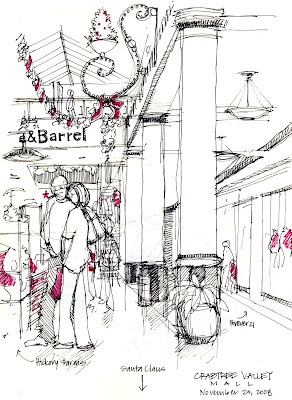 I've never been a mall rat, but I love this drawing here. Can't believe it is already the holidays! You are absolutely, positively wickedly talented! Man alive - I love your blog and your art! I should stop lurking and start leaving more comments. Seriously, you're great. I have to start drawing more. i have turned completely to the internet for my holiday shopping! no malls for this guy!